Moving forward to more recent times, Dr. William Fitzgerald was one of the pioneers of modern reflexology. 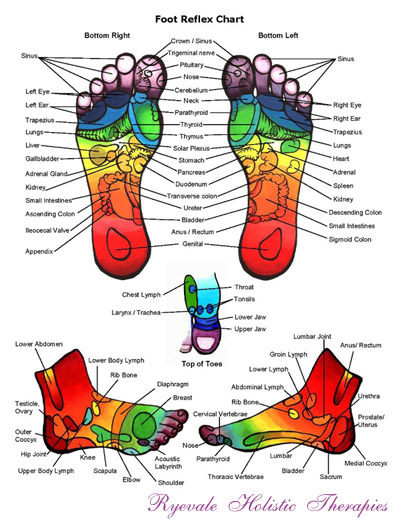 An American, he realised the connection of applying pressure to the feet to relieve various conditions, he called this Zone therapy, an awareness that energy lines ran throughout the body and that there were over 7,000 nerve endings in the feet that connected to all the organs of the body. This was further developed by Eunice Ingham, known as ‘the mother of reflexology’. She developed the foot maps that are still used today by students all over the world. She is credited with introducing reflexology to the non-medical community, making it possible for anyone to learn the technique. Today it is one of the fastest growing therapies in the world and has gained much respect by many health care professionals. It is widely used in hospitals, nursing homes, hospices, and is particularly useful for people with mental or physical disabilities. Reflexologists do not prescribe, diagnose, or treat specific illnesses as such, but work on the body to stimulate its own healing response. Reflexology is for healthy as well as sick people, for young as well as old. A reflexologist works with a healing intention. This incorporates healing deep within the body of the person getting the treatment. The body is being retuned as such and will return to a state of balance. This is a very powerful tool and over a number of weeks, if getting regular treatments, the client will notice a gentle shift of energy and a return of the life force. Encourages the body to heal itself. For maximum benefit a course of treatments is recommended.